AUTOCRAT by New Vision CloudLab is a great merge tool that creates Google Doc or PDFs from Google Sheets data. It is one of (if my my top) automation tool to create and share personalized documents. Reading off spreadsheets is annoying and sometimes impossible. This tool allows you to make spreadsheets readable by essentially turning them into individual (or a single) Google Docs or (new this past August) Google Slides. You can even share the docs that are create with others by email. Create a form that serves a a quiz. Link the form to a Google Sheet. 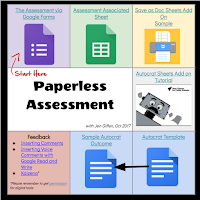 Create a template for the quiz in a Google Doc and include tags to associate the Sheet data. (I.e., type the quiz as you normally would - formatting and all - but instead of blank spaces or lines for student answers, put a tag like <<question 1 answer>>.) You can even include rubrics as part of the template is you wish. Remember: once you create the template you need to be happy with it. If you want to make changes to the format after you run autoCrat it is too late - think making a change to a test once it has been photocopied...you would need to make the change on each test individually. All your test are populate into the template and saved as separate files. What I love most about it is that the assessment won't be lost because you have it digitally. Moreover, you can leave comments within the comments feature in Docs or use programs like Google Read and Write or Kaizena to leave voice feedback! 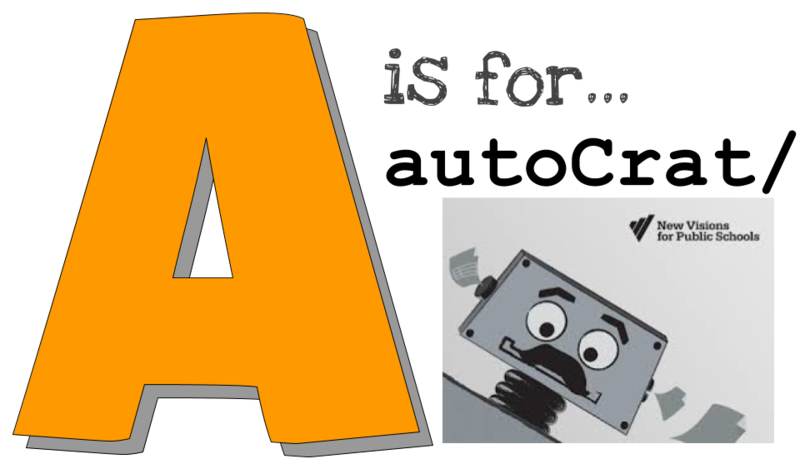 For other ideas about how to use autoCrat - check out my Slide Deck. 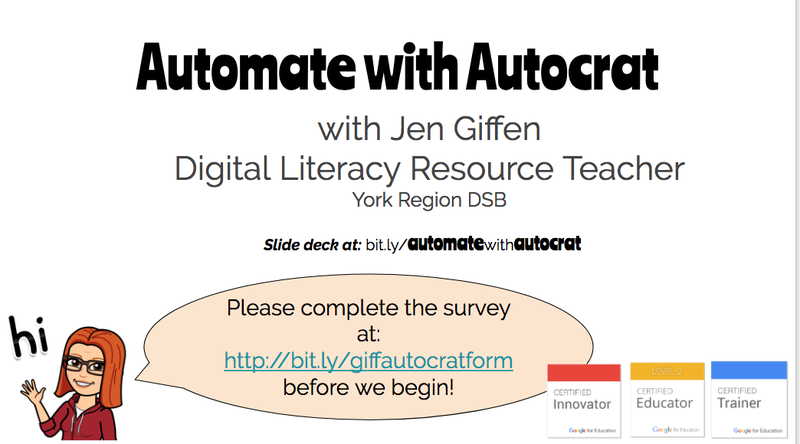 I would like to give a HUGE shout out and thanks to my friend and colleague Kim Pollishuke (#ShukesandGiff) for allowing me to use her "How to Use autoCrat" slide deck within my own. Kim really creates THE BEST resources and there is no sense in me re-creating something when we have this that is so great...and she is always willing to share her stuff. You rock Shukes! Do you have a suggestion for B-Z? Leave me a comment or tweet me @VirtualGiff.